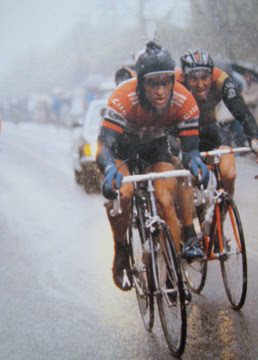 A soggy, cold, miserably wet day here in Vancouver spurred your author to stay indoors and think about winter cycling caps. 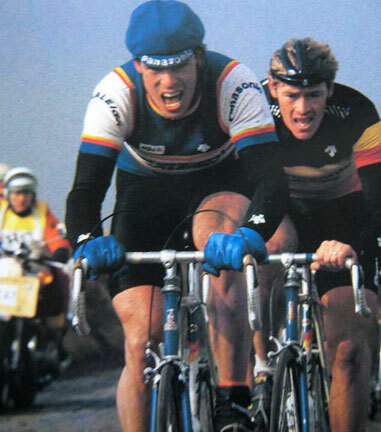 I'm trying to find out the origin of the humble winter cycling cap. 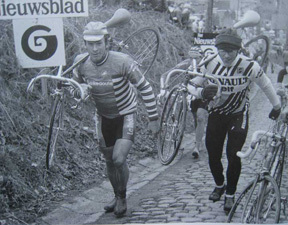 And as far as I can determine, through my research, is that it's probably from wind swept Belgium. It more than makes sense from the land of wet, rain harshness as an important way for a cyclist to stay warm in inclement conditions. Covering the head is important since 40-45% of body heat is loss from the head. 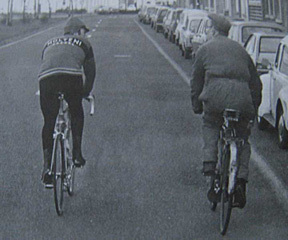 Belgian cyclists can't be wrong. 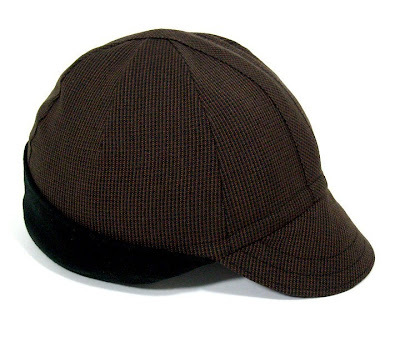 It started with the basic wool brimless cap. Just put on a tuque and ride. And, most likely proceeded with a brim to guard against freezing rain and the cutting wind. Add ear flaps as a perfect, practical way to keep the back of the neck warm. 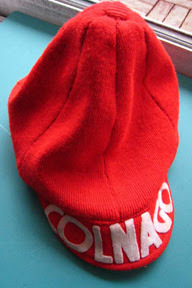 My first winter cycling cap is from the early eighties. In bright red with the bold, COLNAGO in white felt, tastefully on the brim. Well made, in wool with a inside liner, it's certainly does the trick out in the cold. Winter still has it's cold grip on us, and what better way to ward it off by keeping your head comfy warm with Galstudio's Winter Cycling Caps! They're all on sale at a 'cool' price; $ 25.00 USD each, that's $10.00 off the regular price! 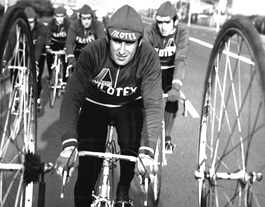 An excellent time to beat off the cold with our attractive, handmade, comfy winter cycling caps. I wouldn't leave home, for a winter ride, without it! 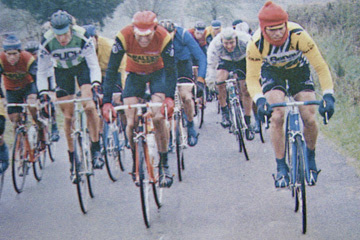 Ti-Raleigh rider(far left) wearing a tuque, Liege-Bastogne-Liege, 1980. Ah yes! My first was brought back to me from Belgium by a friend who went there to race for a year. 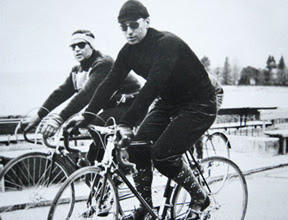 Wool, made in Italy, and I think it was Cinelli embroidered on it. Otherwise, much the same as yours. Mine had an untimely death one winter ride. I crashed hard on a descent in the mountains and ended up having 40 stitches put in my head. The hat was a mess, bloody and torn. I wore it for awhile longer, but ultimately replaced it with another. The good old days ;-) Great pictures of the venerable winter hat in action here! Yes, nothing like good ole headwear for that cool ride! 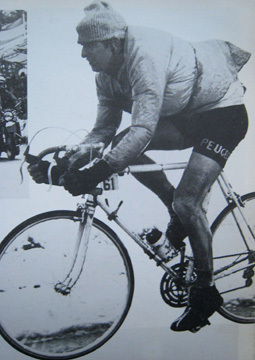 The Raleigh is a nice one. Missed out on the Campy one! That's a heck of good cap story, you're tough as nails! Interesting article. 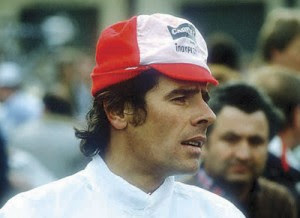 I wrote a few articles on my blog upon the Belgian winter caps. Have you noticed how close those caps are to the US WWII Jeep caps of the soldiers? Enjoyed your article, amazing similarity!